April turned out to be the busiest month so far this year. It began with a few groups of devotees donating for Radha-Syama’s Nitya-seva and inviting the small Radha-Syama for their programs. 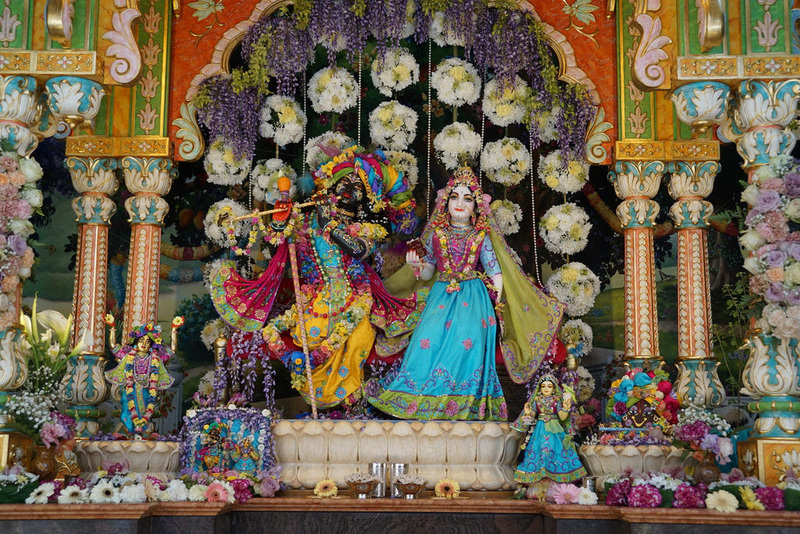 The devotees are always happily awaiting the arrival of Radha-Syama, Whom they serve throughout almost the whole year – mainly with their donations – however in this way they are able to perform a more personal service. The groups host the Divine Couple accordingly and Radha-Syama accept the arrangements of the devotees’ loving service in so many ways: including drama or dance perfomances, special bhajanas for Their pleasure, and devotees are always making lovely flower arrangements for Them too, so by expressing their love and devotion for the pleasure of Their Lordships in different ways, Radha-Syama are ever ready and eagerly waiting in anticipation for new invitations! As we know in the spritual world, there’s a festival every day and even here while we are in the material world, we try to take every opportunity to arrange different ones too. 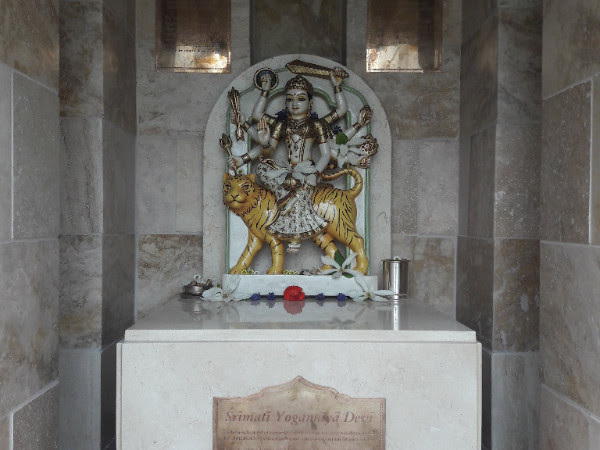 In the middle of April we celebrated both Lord Siva and Yogamaya Devi’s acceptance of Their newly rebuilt temples after a long wait. These are outside and built either side of the frontage of Radha-Syama’s temple, where They are both worshiped throughout the summer season. 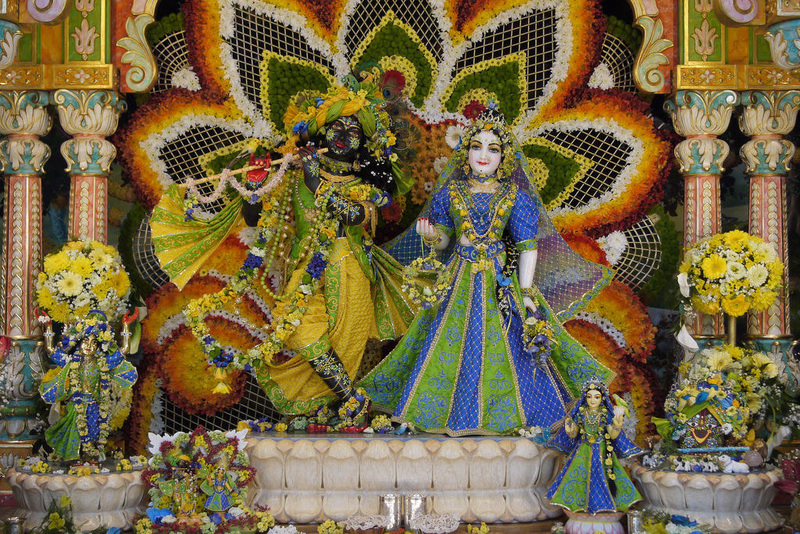 Leaving the Tulsi house the devotees accompanied Them to Their new sites, where the pujaris offered Them arati with everyone offering flower petals praying for Their blessings to become Radha-Syama’s pure hearted servants. We are all very happy that everyone can again take darshan every day of these two dear and elevated Bhaktas of Radha-Syama. During the last weekend of April we celebrated the appearance of Lord Narasimhadeva and Sivarama Swami Maharaja’s Vyasa-puja. Both festival days were so amazing with the darshanas, altar decorations, and the programs… but the most wonderful of events were the morning and evening kirtanas! Bhakti Bringa Govinda Maharaja blessed us with his association as the guest of the festival, so in the morning of Narasimha Caturdasi we started the festivities with a 6,5 hour long rousing kirtana! The next day it was very hard to decide whether the morning or the evening kirtana- which lasted almost until midnight – was the most ecstatic! Thank you so much to all who came, as it was so enthusing to chant and serve together! Nitya-sevawise April was an EXEPTIONAL month! Aksaya Tritiya was in the middle of April, when it is a very auspicious time to give donations. We started to receive emails a few days before then from new donors registering for Nitya-sevas. So on Aksaya Tritiya day a new full payment was received, as well as four new donors starting to pay full amounts in instalments. A kind devotee family then sponsored a second Nitya-seva with one family raising their previous Nitya-seva donation to the present amount. Meanwhile many devotees timed their monthly instalments to that auspicious day too. This meant seven Nitya-sevas were received in a week for the pleasure of Radha-Syama and Gaura-Nitai! 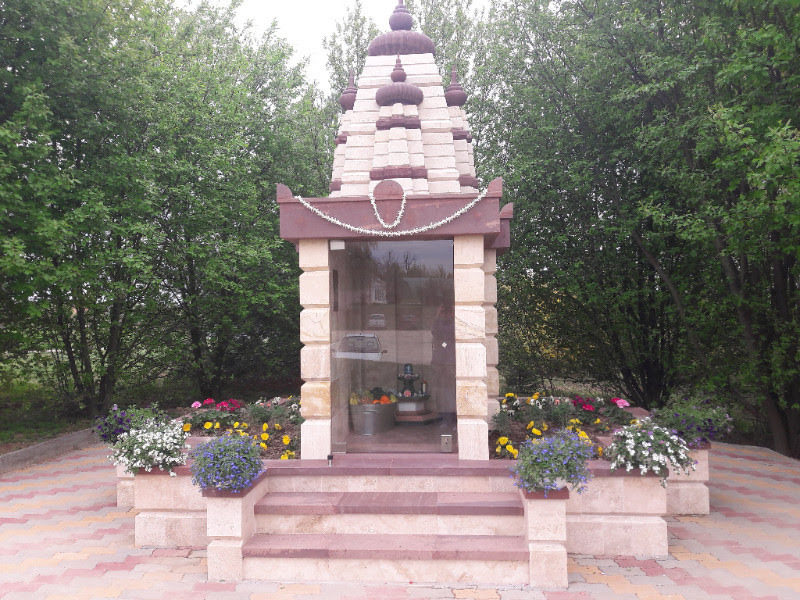 We held a Nitya-seva program on Narasimha Caturdasi for foreign devotees as the Hungarian donors had theirs in December at the Budapest Temple, and we wanted all of you to view the recent reports on the project. Here are some details for those who were unable to attend: more than seventy devotees were present and by the divine ispiration of Radha-Syama we received six promises for new Nitya-seva payments! Devotees were so eager that they immediately booked in their days after the program! We’ve recorded the program too for those of you who missed out and you can watch it on YouTube on the following link: https://youtu.be/e6Zd6QMfcl4 Also in the early morning of the next day we received an email from Australia from yet another new donor registering for a Nitya-seva sponsorship! We would really love to have so many more successful weeks and festivals in the future for the pleasure of Their Lordships, and starting many of our days with such enlivening news! Thank you so much! 6th, 7th, 9th, 16th, 17th, 18th, 21st, 23rd, 24th, 25th, 27th, 28th, 29th, 30th.